The human heart is a paradox, incredibly strong yet surprisingly fragile. And while stories that reveal its symbolic characteristics abound, there are far fewer that laud its physical capabilities, which are also profound. Dr. Elefteriades, one of the most respected cardiac surgeons in America, has treated more than 10,000 patients in his distinguished career. Now, for the first time, he shares fascinating stories of his most memorable patients and cases—patients who have challenged him technically and moved him emotionally, patients who have enriched his life and expanded his horizons while he cared for their hearts. By detailing heart conditions and cardiac reparative procedures with specific yet accessible medical narratives, Dr. Elefteriades, encapsulates the beauty, complexity, and majesty of the human heart. But there is far more to this organ—and these stories—than a collection of veins, arteries, and valves. 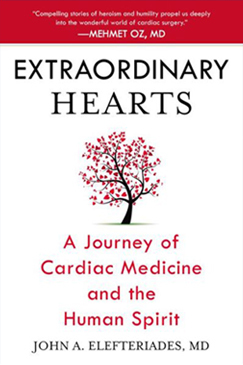 These are stories of courage, miracles, and the bravery of patients (some famous and others not) and their families when facing nearly insurmountable challenges, offering a thought-provoking, informative, and at times heart-wrenching study of the resilience of both the human body and spirit.